My wedding will take place 01.03.15, it is formal, black, dark red & metallic gold accent, our tables will have black table cloths & gold chivari chairs with black seating pads, & dark red chargers. Our reception will take place in a ballroom, and we have 22 tables. Love the color combination of black, red and gold it will look stunning. For that kind of dramatic color scheme I would go with a tall centerpiece. You can get black eiffel vases and then you will need something equally dramatic to have in the vase. 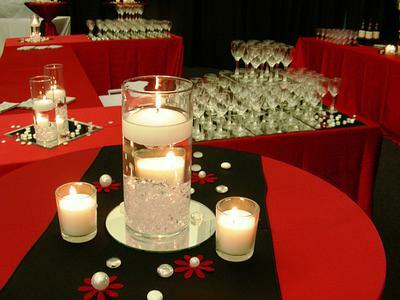 If your budget allows I would have tall red roses or flamboyant feathers which you can get in red or black. Or a cylinder vase with a submerged stem of Orchids. 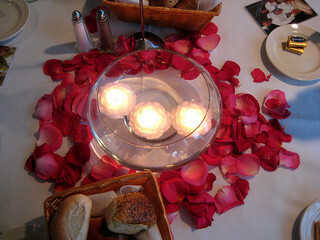 If you are looking for a simpler table decoration then red rose petals make tables beautiful and add candles for extra sparkle. Have the most amazing wedding day.